8/11 Cup of Coffee: It was a strong night offensively on the farm, while the pitching was up and down. 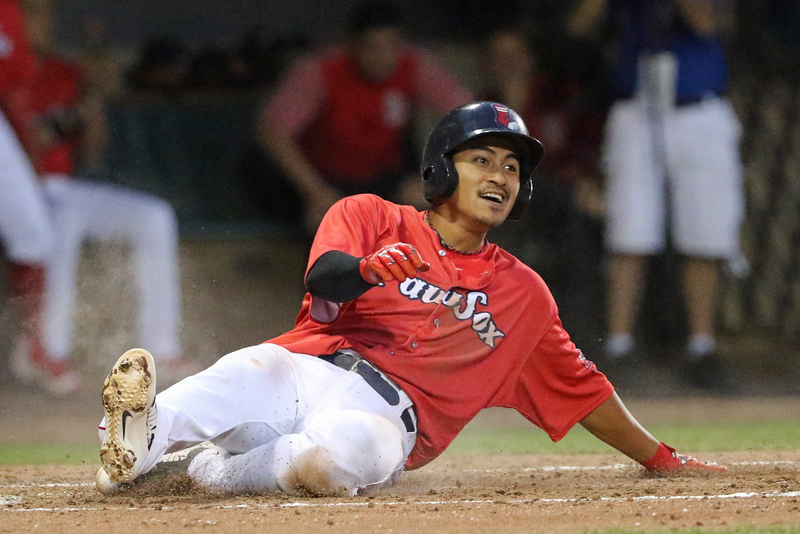 Tzu-Wei Lin (pictured) led the way for the PawSox with four hits, while Michael Chavis continued his recent hot streak for the Sea Dogs. Salem and Greenville each had numerous players hit well, while Lowell's pitching was outstanding in a shutout victory. Several players had strong offensive performances, but Tzu-Wei Lin stood out above the rest with his 4-for-5 night. Two of the hits were doubles and he also scored a run as he raised his average to .327. Tony Renda added three hits while stealing a base and Sam Travis belted an opposite-field home run. William Cuevas was scheduled to start for the PawSox, but he will now be starting for the big club on Saturday. Josh D. Smith earned the win in the spot start, punching out seven and giving up only an unearned run over five innings. Matthew Gorst tossed two more scoreless innings and he has yet to allow a run in seven innings since being promoted to Pawtucket. A single from Bobby Dalbec in the top of the ninth broke a nine-all tie as the Sea Dogs squeaked by the RubberDucks. Dalbec drove in two runs but also struck out three times, while Michael Chavis went 3 for 4 with a walk and scored two runs. Chavis has been on fire, going 16 for his last 28 with five walks and two stolen bases. Jordan Betts and Austin Rei each went deep to contribute to the slugfest. It was a sloppy game for the pitching as the Sea Dogs gave up nine walks. Daniel McGrath was responsible for five of those walks and he surrendered four runs in only 2 2/3 innings, but Josh Taylor was able to limit the damage as he did not allow a run and struck out four over 2 2/3 innings. The bottom of the order did a lot of damage, as Ryan Scott, Jagger Rusconi, and Chris Madera combined to go 6 for 11 with eight RBI in Salem's blowout win. Rusconi had two doubles, Scott had a triple, and C.J. Chatham went 2 for 3 with a run scored as the offense was firing on all cylinders. The pitching was solid, but they were also helped by a team-record five double plays in the nine-inning game. Kevin McAvoy picked up his first win of the season after firing six innings of one-run ball, and Algenis Martinez followed with three innings of one-run ball to earn his fifth save. While Salem was led by the bottom of the order, the middle of the order led the Drive as they doubled up the GreenJackets. Ryan Fitzgerald was on base three times with two singles and a walk, Tanner Nishioka went 2 for 4 with a double and a walk, and Pedro Castellanos went 2 for 5 and drove in two runs. Durin O'Linger moved to 3-1 after striking out seven and allowing one run over five innings. Lowell continued the system's winning ways, blanking the Yankees behind dominant performances from Thad Ward and Hunter Haworth. Each pitcher did not allow a run over four innings, with Ward striking out six and Haworth punching out three. Lane Milligan was the star offensively, going 3 for 4 with two doubles, while Grant Williams and Korby Batesole had a single and a double. Esteban Quiroz began a rehab assignment with the GCL Red Sox on Friday and his impact was felt immediately as he went 2 for 3 with a triple, three RBI, and a run scored in the one-run victory. He had not played since April 23 with the Sea Dogs after going down with an injury to his core. Juan Carlos Abreu went 3 for 4 with a walk and two runs scored out of the leadoff spot, and he is now 12 for his last 25 as part of a six-game hitting streak. It looked like the Red Sox were going to cruise to victory in this one as they scored in each of the first four innings and Edilson Batista started the game with three hitless innings. Andres Jimenez gave up four runs in the sixth to make this one closer, but Alberto Franco got his second save after allowing one run over the final two innings to close it out. Kelvin Sanchez’s quality start was not enough as the offense struggled to get going. Sanchez gave up three runs, two earned, over six innings, walking two and striking out four. Three players had multi-hit games for the Red Sox with Gilberto Jimenez, Wilker Vargas, and Fabian Andrade all collecting two hits, while Andrade also had a walk. Unfortunately, the team went 1 for 9 with runners in scoring position as they failed to capitalize on numerous opportunities. The Cubs scored an unearned run in the top of the ninth that proved to be the difference. The Cubs runner was attempting a steal of second base and the throw managed to get by the center fielder and the runner came all the way around to score. Hansel Viola was the tough-luck loser because of that error as he dropped to 1-3 despite not allowing an earned run over 3 1/3 innings. Kleiber Rodriguez had the only offensive performance of note, going 2 for 4 with two doubles and an RBI. Player of the Night: Tzu-Wei Lin has been battling some minor injuries of late and he only had one at-bat since August 1. He showed no signs of rust on Friday night as he went 4 for 5 with two doubles. The injury likely cost Lin some time with Boston as Tony Renda was called up after Ian Kinsler went on the disabled list, but Lin is now hitting .327/.378/.476 and he will get many chances to prove he belongs on a major league roster in September after rosters are expanded.